In statistics, information is collected using qualitative or quantitative data. The collected data is then organised using scales or levels in order to classify the data correctly because not every set of data is of equal value and can be analysed further. 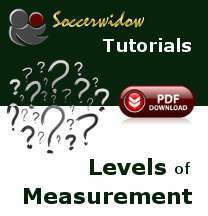 For example, whilst the total number of goals in a match can be counted easily allowing various arithmetical interpretations, the inclusion of a certain team in the league cannot be expressed as a meaningful number and may only be used for categorising the respective data set. It is very important to be aware of the scales of measurement and to assign the correct levels as they not only express how quantitative a response is, but also to what extent meaningful computations can be applied. Given a list of shirt numbers of players, it is certainly possible to perform all sorts of calculations but none will provide any meaningful results. What is one shirt number divided by another one? A complete waste of your time as this data belongs to the nominal scale. Unfortunately, it is not always as obvious which data will lead to meaningful results and which not. Therefore, when you are collecting data, think before you calculate. The level of measurement you are working with will determine what makes sense to do and what to leave well alone. Probably the most prominent misleading data set is the order of teams in the form table. This data is ordinal scaled and exists purely to put teams in an order. However, in practice, punters pay a lot of attention to the form tables (often even just the last six results! ), but unfortunately these data are pretty useless in terms of meaningful analysis and drawing conclusions for betting. PayPal is an online payment service that is world-wide used for processing secure payments on the Internet. Paypal supports all major payment methods such as direct debit, credit cards and deposits. Should you wish another payment option then we also offer Neteller, Skrill (Moneybookers) or bank transfer.